There is plenty of Thai food you rarely see on the menu in Europe or the US. The very tasty Suki Haeng comes high on that list. Don’t ask me why, it’s a puzzle I don’t have the answer to. Suki Haeng is the “dry” fried version of Sukiyaki (hot pot), basically Sukiyaki without broth. In other words not a soup anymore. 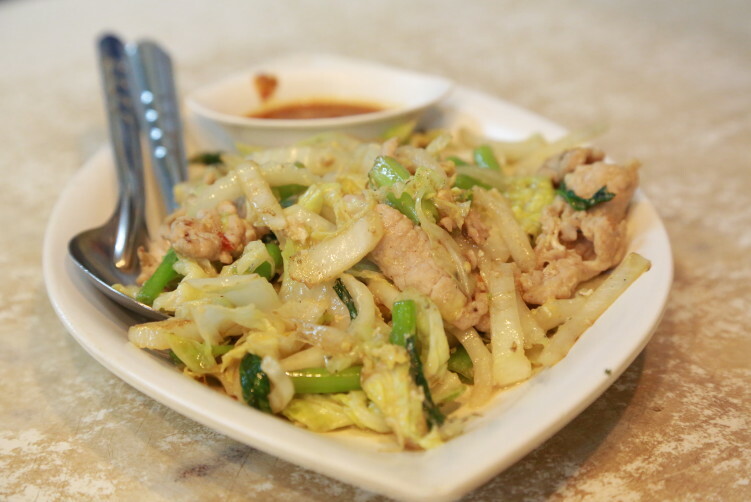 Maybe the time has come to change your favorite Thai dish from Pad Thai to Suki Haeng. As so many times before, I find myself in Dinso Road, the area between the Giant Swing (Sao Ching Cha) and the Democracy Monument. It’s a foodies heaven, with plenty of very good vendors, all in walking distance. Basically one of the city’s more atmospheric thoroughfares. This time I stop outside Sor Na Wang. It’s already a couple of hours into the dark side of the day and as quite often with good resto’s, there are never enough tables inside during rush hours. As I have been here quite many times, I know it’s worth a wait as it’s one of the better destinations for fried noodle dishes in town. Five minutes later I’m seated. Thai’s seldom occupy a table for long, they eat, they pay and they leave. Being practical about it. Sor Na Wang is a tiny shophouse opposite the City Hall in the old Bangkok. I decide on the Suki Haeng and the Mee Phat Krachet (water mimosa fried with seafood/pork, green beans and thin rice noodles). It is two dishes you most likely haven’t heard of, unless you live or have spent some time in South East Asia or constantly have testing new food as a priority on your to-do list. Both of the dishes, when well prepared, have a delicious smoky flavor that comes from the very hot wok. But first the history in short. Thai-style Sukiyaki is derived from the Japanese shabu shabu. They replaced the normally mild flavored broth with chili, lime and garlic sauce. And as that wasn’t enough, they took it a step further and removed the hot pot and the associated broth and created a dry noodle dish, known as Suki dry or Suki Haeng. The ingredients are still the same, it’s just not a soup any more. It’s a fried version. Those Thai’s! What can you say?An incredible dish when well made and Sor Na Wang doesn’t dissapoint and serve it with a delicious smoky flavor as a welcoming bonus. The thin rice noodles are now the base of the dish instead of being a supplement to the broth as in Sukiyaki. It can be served with thinly-sliced beef, pork, or whatever other protein you wish, the most common is pork or mixed seafood. An egg or two are added, together with tons of vegetables. In Thailand, water spinach, green onions, and napa cabbage have become the standard. The Suki at Sor Na Wang has well marinated pork, mixed with cabbage, green beens and the thin rice noodles as main ingredients. And as always when it comes to noodle dishes, it’s for you to season it further if you want. It comes with a chili sauce to dip or pour on. Spicy but definitively not overly spicy. A delicious dish. 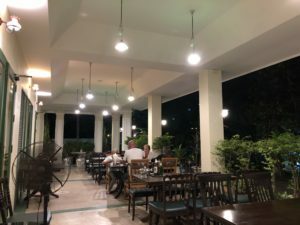 There are other well known resto’s that also stands out in Bangkok when it comest to Suki Haeng and Elvis Suki and Maverick Suki is two of them. My preference still lies with Elvis as the best one. A performance that speaks for itself as this is something of national dish. Sor Na Wang is certainly not far behind, but Elvis Suki wins on the fact that their pork is more marinated and tender. Don’t get me wrong, the Suki Haeng at Sor Na Wang is worth the wait. 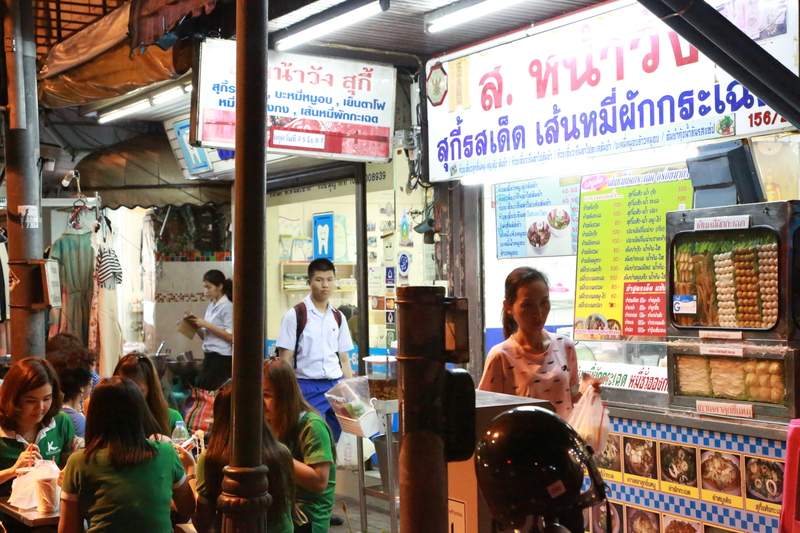 Then to the Mee Phat Krachet, which is one of the better once in Bangkok. It’s also one of Thailand’s most satisfying but little-known noodle dishes. The thin rice strands known as sen mee is fried in a wok with pungent water mimosa (peak krachet) studded with a coarse chili, the garlic mixture and a bit of fish sauce in addition to the protein. It’s often associated with seafood restaurants and the usual serving is with rings of squid and fresh shrimp or prawns, but there are resto’s that dish up a mixed version that includes slices of pork, or just serve it as straight pork or chicken versions. Then you do the rest yourself, season it with the ingredients on the table if you want it hotter, sour, sweeter etc. This time I had the pork version, to try something else then the seafood version with generous rings of squids and shrimps I have kept eating at earlier visits. The pork version was good, but the seafood version is even better. The tart and salty dipping souce combines fresh chili, chopped shallots, fish sauce and lime. click here Price: Around 70 BHT a plate. click here Open: Daily, 10 a.m.-11:30 p.m.
How to get there: Located in the Phra Nakhon district of Bangkok on Dinsor Road Almost opposite the City Hall. Taxi is your best option if not in the area. Bus alternatives to Dinsor Road are 10, 12, 19, 42, 89, 96.